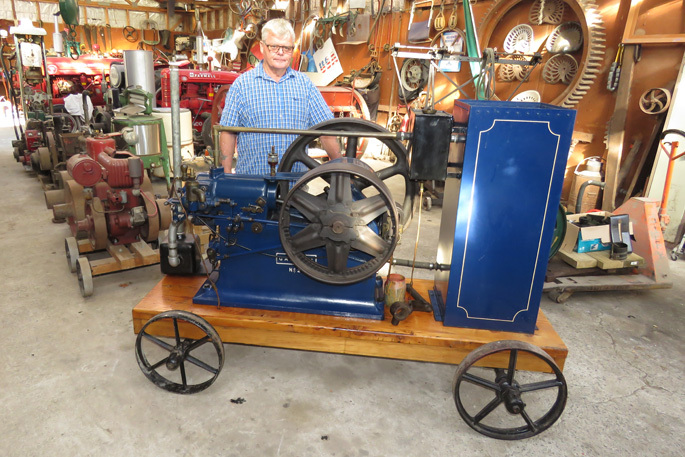 Tauranga Vintage Machinery Club member Eric Green with a Gardner water pump he’ll display at this year’s Crank Up Day. Western Bay of Plenty residents are being welcomed to get back to basics and see how vintage machinery and equipment made the world spin in bygone years at 2019’s Crank Up Day in Katikati this month. Hosted by the Tauranga Vintage Machinery Club, this year’s event on Sunday, April 7, has a timber theme, meaning demonstrations and items on display will pay tribute to New Zealand’s early timber industry. Milling of NZ’s extensive native forests was one of the earliest industries in the European settlement of the country. And as the new colony established, timber was the most common building material, and vast areas of native forest were cleared. Eric says the April 9 event will have machinery and equipment on display that pays homage to the early years of NZ’s timber industry – think timber jacks, saws, old axe heads and such like. “Club member Michael Cooper’s two bulldozers – a D6 and a D9 – will be doing various tasks, like winching a large hunk of gumtree we cut down the other day, and there will be different timber saws for cutting wood,” says Eric. Plus all the usual vintage tractors, stationary engines and bit and pieces will be on display or doing demonstrations on the day too. “I have an old sheep shearing plant, which I got going the other day – and George Winter will shear sheep with it in on-site demonstrations,” says Eric. Club president Larry Williams will have two tractors – including a Mogul that is more than 100 years old – at the event, which is hosted on Michael Cooper’s property. Free gig and hay rides will be running, plus the popular tug of war – which pits people against a small tractor or bulldozer. Eric says the club hopes to attract all ages to the event – “because there is something for everyone”. “Katikati Scouts have a barbecue on offer but people are welcome to bring their own food as well, plus we have the Legion of Frontiersmen J Troop Katikati, led by Val Baker, directing carparking for us,” says Eric. The Tauranga Vintage Machinery Club’s Crank Up Day is on Sunday, April 7, from 10am-3pm on Hot Springs Rd, Katikati – and will be signposted from State Highway 2. Admission is by donation. Children enter for free.